Do FSBO Homes Really Sell for Less Than Agent-Listed Homes? In the Real Estate business I often hear the claim that FSBO's sell for significantly less than houses listed by agents. I've heard claims that the final price will be lower on a FSBO by 10%, 13%, 16%, 20%+ of the potential price! With an education background in Finance and Economics, I'm always interested in (and very wary of) statistics and studies. I decided to track down the data behind this consistent claim. It didn't take long to find the bit of data to which most people are referring - a short quote from a NAR produced report called "Profile of Home Buyers and Sellers". "FSBOs typically sell for less than the selling price of other homes; FSBO homes sold at a median of $185,000 last year (down from $210,000 the year prior), and significantly lower than the median of agent-assisted homes at $245,000." So... what does this mean?! Do all FSBO listings sell on average for less than agent-listed properties? I have no idea - but probably not!! Read below for my explanation. Why am I looking into this at all? As a REALTOR I should be trying to convince people of this same thing so I can win those listings...right? Why? Because I believe in the true value of a real estate professional! I don't need to rely on contorted statistics to sell that value. I believe in the value that I bring to the table in terms of my marketing ability, market knowledge, pricing skills, negotiating prowess, transaction knowledge, liability coverage, and contract expertise. I think it's crazy that anyone would try to sell the most valuable asset in their life in their spare time with cheap tools and secondhand knowledge. These are important transactions that require the time and expertise of a dedicated professional. This isn't a garage sale or used car sale - there's a ton more at stake and a ton more to do and think about in the case of selling a home! I offer services that far exceed the cost of my commission, and I truly believe that hiring me gives you the best chance of achieving the timeline you want, and getting more money in the sale of your home than the 6% cost of my services. Ultimately, my success is your success - and that comes through in the passion and effort I put into getting my listings sold for top dollar. Contact me for a free, no-pressure listing consultation. I'll show you examples of my marketing and give you a confident price analysis for your home. Do the math - the way this is being spouted is that of 2 identical homes, the FSBO listed one will sell for almost 25% less than an agent-listed home. Common sense says that's crazy, right?! The fallacy lies herein: the data above is true, but it is unclear. It takes into account all the different markets, different regions in the US, different price points, different home types, different agent abilities, etc… There is no isolation here of the "agent" variable, therefore, based on this statistic, no confident assumption can be made regarding the impact on sales price based solely upon whether or not an agent is involved in a residential transaction! 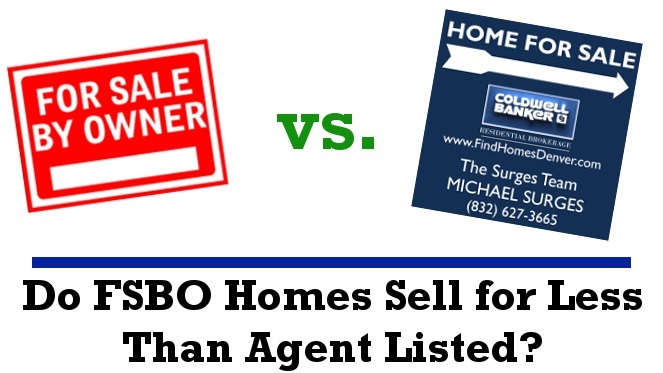 It may certainly be true that if you isolated the agent variable, that the average sales price of an agent-listed home is higher than a FSBO. However, the NAR statistic above does not substantiate this claim and should not be misrepresented in that way. I explained above why I think it's worth the money to hire a professional like myself. Don't listen to the agents that spout nonsense statistics to try and win your business, but please don't let their misinformation distract you from the true value an agent like myself can bring to the table. I am of the confident opinion that it's in the best interest of everyone to hire a professional like me to represent them in this enormous, stressful transaction. Please contact me for a free, no-pressure listing consultation. Let's work together to get you the most value for your home!